Miranda has been practicing yoga since she was 17 and credits it for helping her to stay calm, balanced and focused throughout her career and times of unrest. After trying different styles her favorite practice is Kundalini. But she stresses that it’s important for you to try the many different styles and practices of yoga to see what best works for you—it’s a very personal and spiritual connection. The purpose of yoga is to create strength, awareness, and harmony in both the mind and body. In addition to the many physical benefits such as increasing flexibility, muscle tone and perfecting posture, yoga is also known to strengthen the nervous system, increase blood flow and metabolism, boost immunity, regulate your adrenal glands and encourages you to relax, slow your breath and focus on being in the present. 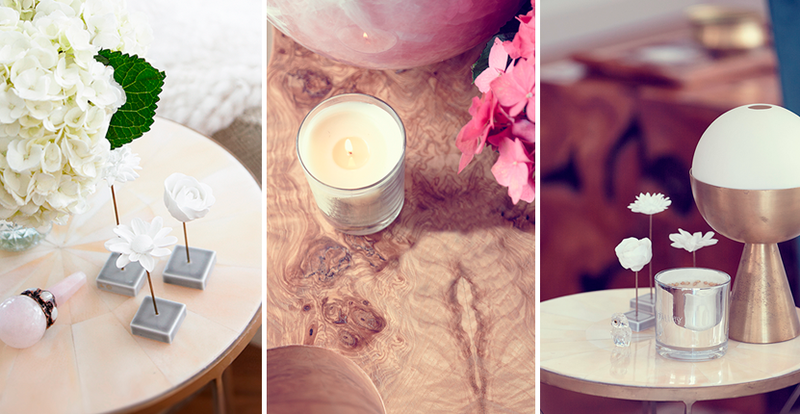 It can be beneficial to create a special space in your home for holistic activities such as yoga, relaxation, and meditation—for you to disconnect and recharge. 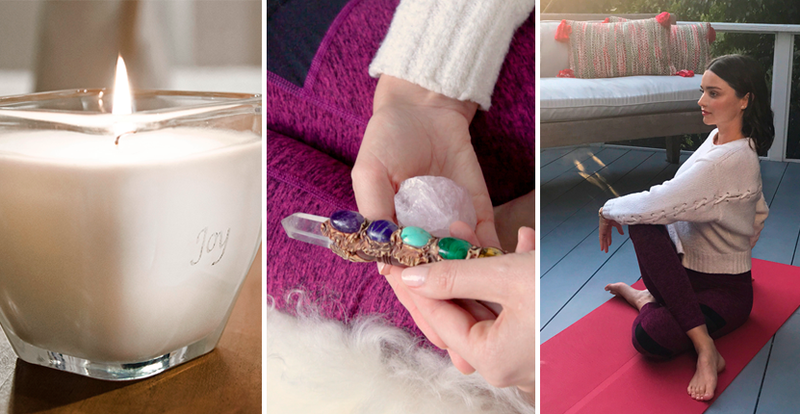 Miranda has kindly shared her cherished scents, sounds, and crystals, so you can create a sanctuary in your home and enjoy your daily practice. KORA: Do you listen to music when you practice or relax? Namah Shivaya by Krishna Das. 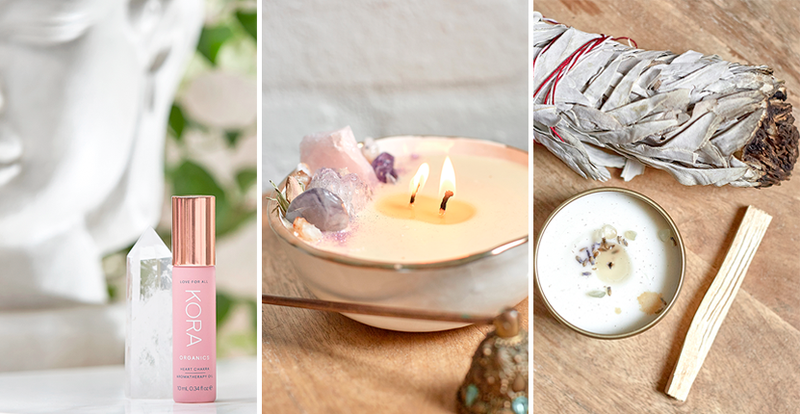 KORA: Do you incorporate aromatherapy while you practice? 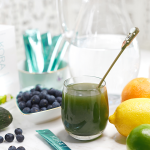 Miranda: I apply my KORA Organics Heart Chakra Aromatherapy Oil before I begin to help relax and bring my mind, body, and spirit into a calm and present state. I burn Sage and Palo Santo to clear the energy of the room and like to light a candle. My go-to candles are from Holly Star’s Matter & Home range, they are designed to uplift and support the body, mind, heart, and spirit; and they also have healing and space clearing benefits. I have aromatherapy diffusers in nearly every room in my home and use different essential oil blends depending on my mood. I like the doTERRA and Young Living oils, as well as SEOC essential oils. KORA: What crystals do you have in your relaxation space? Miranda: Amethyst, Clear Quartz, and Rose Quartz. I also have a little crystal wand that I often hold when I meditate – it fits perfectly into the palm of my hand and is great for travel. KORA: What is your motivation for practice every day? Can you share with us a quote, affirmation, or belief that can help motivate our readers to practice every day? Miranda: I know the positive impact yoga has on my mind and body, plus I really enjoy it so that’s motivation in itself. In terms of sharing a quote or affirmation, I like to read the daily affirmation Yogi Bhajan to start practice, inspire motivation and set my intention for the session. At the end of a session, I like to read a piece from the book “To Bless This Space Between Us” by John O’Donohue. KORA: What is your favorite yoga pose and chant? Miranda: I like to practice at sunrise or sunset, it’s believed that’s when you get the most out of your practice. Sometimes I do both! Squats – builds strength in legs, back, hips; enhancing blood circulation and stretches pelvic region to help prepare for birthing. (If baby’s position is breech or unknown, it is not recommended to squat). NB: Remember, every woman and pregnancy is different so listen to your body and if a pose feels uncomfortable, don’t do it. Miranda recently teamed with Royal Albert to share her tips on optimum health, yoga, and wellbeing. Shop the range of Miranda Kerr for Royal Albert here.